-34° to +50° while crouching. 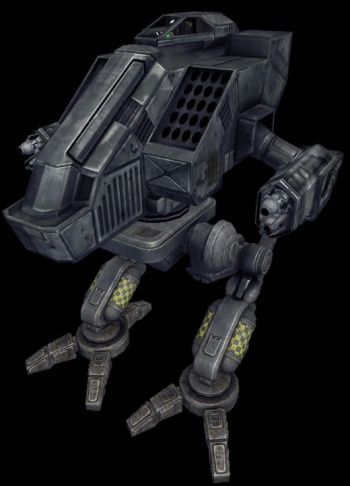 The Vulture (Clan designation Mad Dog) is a Clan Heavy Mech used primarily in highly specialized fire-support roles. Normally not found on the front lines, Vultures typically circle at the fringes of the battlefield, utilizing their powerful Weaponry to pick off stragglers and cripple stronger opponents. Its moderately heavy armor offers adequate protection against most counter-attacks, while unlimited torso rotation allows it to fire at the enemy even during retreat. Vultures are fairly affordable in regards to other Clan Heavy Mechs, and as such doesn't pack quite as much in terms of Weapons, Equipment or Armor. However, some Vulture variants are equipped with GECM, allowing them to stalk their prey while enjoying a measure of Radar invisibility. 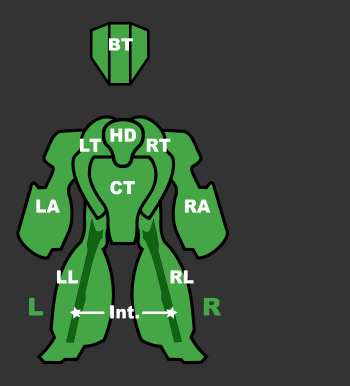 Vulture pilots should be aware of the design of the Mech's side torsos. Enemy Battle Armor can land onto them and blast at the cockpit from the side, or crouch down to remain hidden from Vulture teammates trying to blast it off. The Vulture Prime is the most adaptable of all the Vulture variants, mounting a powerful array of Lasers backed up at long-range by Torso-mounted Missile launchers. 2 cLPLs and 2 cMPLs gives the Prime Variant potent close- to mid-range firepower, and the twin cLRM15's give it a respectable long-range punch. When used with EOptics, the Vulture Prime can barrage foes at long-range, and accurately disable closer enemies with well-placed Laser fire. The 6 Double Heat Sinks provide barely adequate cooling for the heat generated by the Pulse Lasers, so a pilot must carefully watch his heat levels. A much more expensive alternative to Vulture Prime is the Madcat Prime which mounts a similar array of LRMs and Lasers, but with increased armor, more equipment, and less maneuverability. Informally known as the "Gauss Dog", the Vulture A variant is an excellent long-range fire support configuration. Armed with twin cGauss Rifles and with its EOptics suite, the Vulture is a classic sniper that is capable of inflicting devastatingly precise damage at long-range. Ideal for crippling slower Assault Mechs as well as picking off enemy missile boats. When used with skill, it is also capable of destroying light Mechs with ease. Four free tons for ammo give it considerable potency in drawn-out encounters, however its only backup weapons are two cSRM2s, which is inadequate for killing anything except Battle Armor making the mistake of standing still. That being said, staggered chain fire with these can be fairly disruptive against foes who's weapons require good aim. This unit has enormous fire power. Mounting one CERPPC Extended Range Particle Projection Cannon provides a 900m reach to soften up your opponent but also generates noticeably more heat and longer recharge time than standard PPC's. At 400m the twin Clan Heavy Lasers CHMLs will start slicing off your opponents arms but produce quite a bit of waste heat which must be carefully managed to prevent overheating. Two Advanced Tactical High Explosive Missile Launchers ATM 9 HE come to life at 300m with a 1 second lock time causing your opponent continuous shaking due to the staggered launching pattern making it almost impossible for them to return fire. Even with 7 Double Heat Sinks DHS one needs to keep an strong eye on the temperature range. Alpha strike is not recommended. When hunting with this unit, stay with your pack. Formery known as the Yeoman, the Vulture C Trebuchet mounts two cLRM20's and one cLRM15's, making it the most powerful ground-based missile boat currently available. It is capable of firing a massive volley of 55 missiles at a time - more LRMs than any other unit. It sports 3 CERMBL for medium-close range firesupport. This ridiculous firepower is offset by poor heat management, sacrificing armor, as well as the close-range difficulties. Slowly chain firing helps noticeably with the heat issues and provides a stream of missiles impacting your foe. 3 extra tons of cLRM reloads helps with sustained battlefield presence. Another saving grace is that it can't poptart, however that can be largely negated if this variant is used in conjunction with NARC/TAG units. The 360 degree torso twist makes this a particularly mean variant on wide open maps due to ease of kiting slower heavies and assaults. Good for both longer range fire support and anti air roles, the D variant packs a straightforward configuration of 2 cERLBLs, one in each arm, and 2 torso mounted ATM9s. EOptics enhance the accuracy of the lasers, while a GECM suite provides radar cover which allows the unit to stay active for missile locking. An extra ton of armor and two tons of ammo for the ATM's helps to provide for an extended stay in the field. Care must be taken when running hot so as not to damage the five DHS when firing both lasers at the same time, as they generate a huge spike in heat; alternate fire is recommended. A almost brawling dream, the E variant has many things you could ask for in a close range variant with the exception of MASC and GECM. The Vulture E carries 2 CMPLs, 2 CERSBLs, and 2 CDSSRM6s. Four tons of reloads on the SRMs allows for liberal missile fire, 3 DHS strugles to manage heat thou. Impressive 2 extra tons of armor helps with surviving in a heat of a battle. This variant is capable of standing against many other brawler 'Mechs in its weight and price class as a result of the thicker armor, while it will effortlessly bulldoze smaller assets with constant SSRM barrages. A variant capable of seriously ravaging nearly any asset in its weight bracket or lower, the Vulture F fields decent weaponry for long range engagements and absolutely devastating weaponry for close range ones. Long range firepower comes in the form of a single CLBX5 and a single CERPPC - each allocated to an arm. This weapon variety allows for mixed roles of sniping, light anti-air, Battle Armor hunting, and fire-support. The F variant's main punch, however, is in its three ammo-hungry Dual SRM 6's, which can easily blow through armor and savage most light and medium mechs in a single pass. A single additional DHS often proves to be hardly adequate in managing heat from aggressive weapons use, so chain-firing the DSRM6s is recommended to lessen the heat load. Three free tons of ammo (usually all used for the DSRM6s) provide some battlefield endurance. Variant G Another variation on excellent fire- and anti-air support, the new G variant carries the hallmark dual cLRM20 launchers 1000m Lock Range / 1470m Max Range, supported with 3 cUAC2's with a listed range of 1200m, offers a respectable punch. Autocannon accuracy is improved through the EOptics suite and allows for longer range passive sniping with weapons that don't trace back to their source. Beagle Active Probe or BAP boosts detection range by 200m giving it a maximum ranger of 1200m, keeping the Vulture G somewhat out of harms way. The final piece in it's arsenal is a TAG laser, allowing to pick out targets for allies and allowing pilots confident in their aim to guide missile volleys without waiting for a lock. Should a large assault catch you in close range, utilize your 360 torso to walk away while shaking their screen as much as possible with your cLRMs and try and lure them towards your teammates. Known to its Clan designers as the Mad Dog, it was given the moniker of Vulture amongst the Inner Sphere because of its hunched-looking shoulders and protruding torso. Originally developed by the Smoke Jaguars in 2963, the Vulture is intended as a support Mech capable of delivering a missile-heavy payload to the target. Some configurations sport heavy direct-fire weaponry such as the Vulture-C, which mounts a pair of Clan Gauss Rifles, one in each arm. This page was last edited on 29 January 2019, at 14:40.